While the feeding robot slowly passes by, cow 9273 bumps with her nose against a big round brush. It looks like the ones in the carwash that clean the rims of your car, but then bigger. Food is not what she’s after right now, her itching back is demanding all her attention. Cow 9273 has to push several times before the brush starts slowly spinning, but when it does, she treats herself to a firm back massage. Welcome to dairy farm ‘The Promised Land’ where 1.5 fte and nine robotized computer systems manage a herd of 280 cows plus 180 ‘youngsters’. 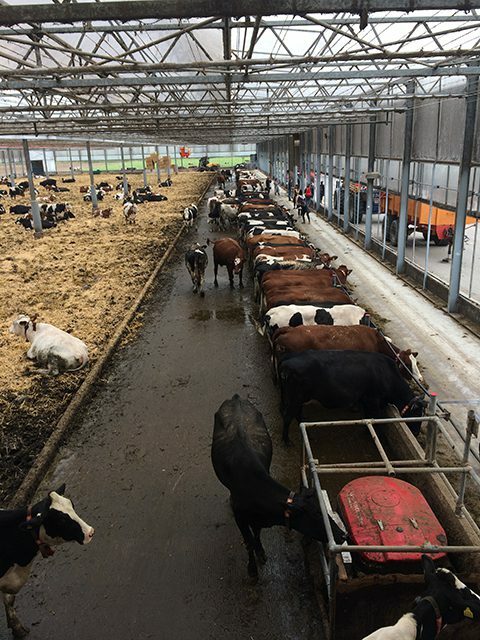 After a full day of exploring the ‘backyard’ of the Randstad, as most urbanites would see it, visiting two dairy farms, an orchid nursery (the size of eight soccer fields, or was it twelve?) and a manufacturer of climate control installations and systems, the group we’re part of has become convinced that technology is all pervasive in the countryside. Most of us knew about ‘mechanization takes command’ kind of developments – milking machines, conveyor belts, combiners and the like – but hardly anyone of us citizens was prepared for the scene of a herd being managed with an app. by a farmer with a smart phone in his hand. For each cow the body temperature (a health indicator), the amount of food taken in, the amount of milk produced, the amount of time taken to ruminate, the amount of manure produced and much more can be registered real time. And if anything unusual, anything out of the bandwidth ‘happy, healthy and productive’ is registered by one of the smart systems, the farmer is notified instantly. 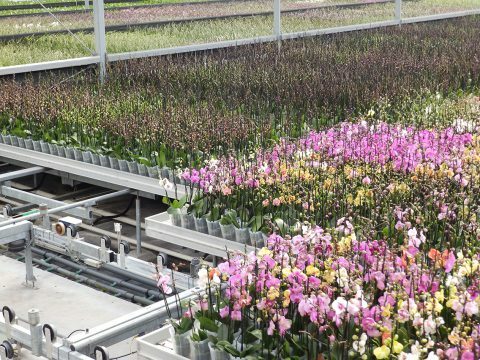 When it comes to growing, orchids in this case, the levels of control are close to 100%. The number of flowers per stem, the number of stems per plant, the height of each stem, the color of the flower, the size of the flowers, it’s all being manipulated by sensors and automated systems optimizing production and uniformity of the product. And that includes the avoidance of damage by snapping or spoiling plants, adding to the efficiency of production. 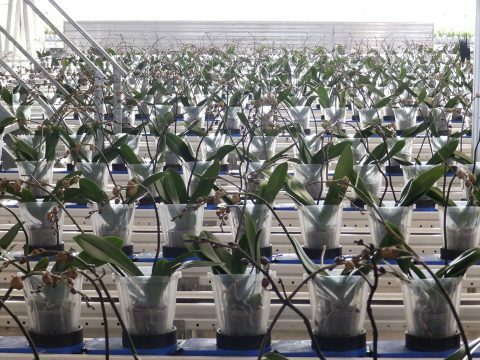 Not by the hundreds, not by the thousands, but 1.5 million potted orchids in different stages of development under one glass roof. If there is a next level, the last visit of the day to a producer of climate systems shows the way. An oversized sea container has been transformed into a closed system to grow tomatoes. Light, temperature, air humidity, food, it’s all controlled and optimized for max production. All it needs is a socket and a spoon full fresh water, for the rest the system is autonomous, ready to produce any place in the world. Are we looking at complete synthetic nature, the end game of the human’s struggle with nature and food production? Genetically improved designer plants forced to produce preestablished amounts at a predetermined pace within completely controlled conditions? But then, if the substrate we grow on is no longer natural soil, can we finally reintegrate city and food production after centuries of drifting apart? When looking at agricultural production, that future is knocking on the door of the present, although scale is still an issue in relation to the investment in land and buildings. When looking at life stock a different picture imposes itself: after centuries (if not millennia) of animal enslavement, a development that accelerated after the second world war in an unprecedented reduction of animals (chickens, cows, pigs etc.) into commodified products, the latest robot supported systems allow for an (almost) natural habitat and behavior of at least cows. Instead of an ever more artificial, forced and confined life, present day high tech managed dairy cows are living a life of their own choice: they leave the shed into the open (meadow) when they choose to, they are being milked by the milking robot when they feel like, they eat when they are hungry the grass they like (selected to optimize milk production), and they lie down to ruminate when they think it the right time and where they feel most comfortable. So, technology 2.0 allows for a more natural way of living for (dairy) cows, than we have seen in close to a century. Maybe this is techno optimism, maybe we overlook some consequences, maybe we should discuss this more in depth. Let’s do so at Het Nieuwe Instituut, Rotterdam, Thursday, November 22nd: Automated Landscapes: The Countryside Tour, 7.30-9 pm!